Wondering what this ABC halwa is :). 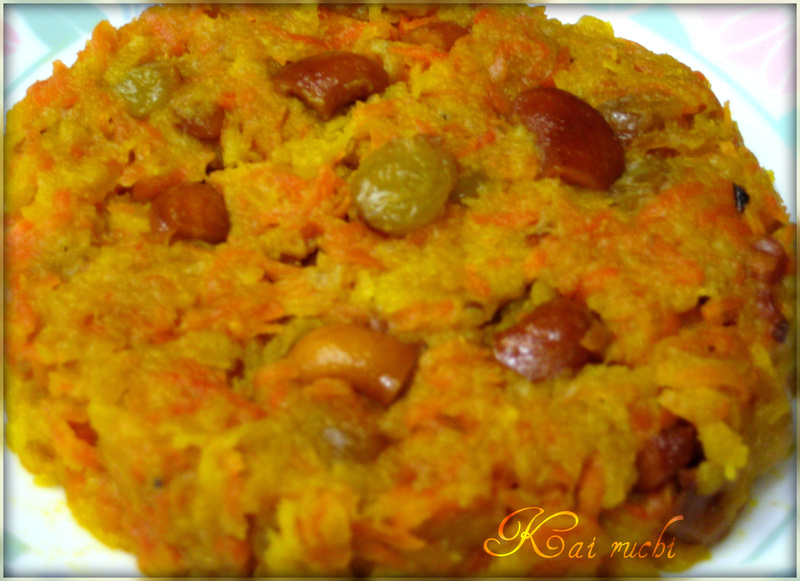 It stands for apple, banana and carrot halwa and can be prepared very quickly. Its a favorite sweet for kids. My mother-in-law has come to visit us. We both are very enthusiastic about preparing sweets because, sweet is all time favorite at our place. We have prepared many sweets in the last few months and did not want to repeat any and were wondering what do we prepare next. Fortunately she had brought her recipe book where, she found the recipe for this sweet . I prepped everything quickly and the sweet was ready in minutes. In a heavy bottom pan, heat ghee, add cashews ( I added around 10-12 cashews, and 10-15 raisins) fry until golden brown. Add raisins, remove quickly and keep aside. Next add grated carrot and apple into the ghee,cover and cook for 5 minutes. Add banana and whipping cream (can use milk too) and mix well. Cook for another 3-4 minutes. Add sugar( if the fruits are sweet enough, add less sugar. Sugar can be added at any point) and mix shredded coconut. Do not cook too much after adding the coconut. You would want to leave it a bit crunchy. Turn off the heat, Mix cardamom powder and garnish with cashews and raisins. Nice click! i am drooling over the photo. Hi thanks for visiting my blog and giving a nice comment.you too hav a lovely blog with nice recipes. Lovely photo. Yummy looking halwa. Healthy and looks yummy too. What a nice way to incorporate the fruits and vegetable in a sweet. Good one! I am happy to know your son got to eat the fruits! ABC sweet.. new name & lovely it looks.. saw ur comment on my space & wanted to say..am happy to know a fellow jain-ite 😀 & blorean ! That’s really wonderful to know! small world you see:). Wow, a new and superb one, never tried the ABCs together, awesome..
OMG, this looks so good. Would love this warm with a dollop of vanilla ice cream. Craving it now. It will be an awesome combination! Hi,thanks for visit my blog,interesting recipe sound Yummy,i love all ingredients in it !! 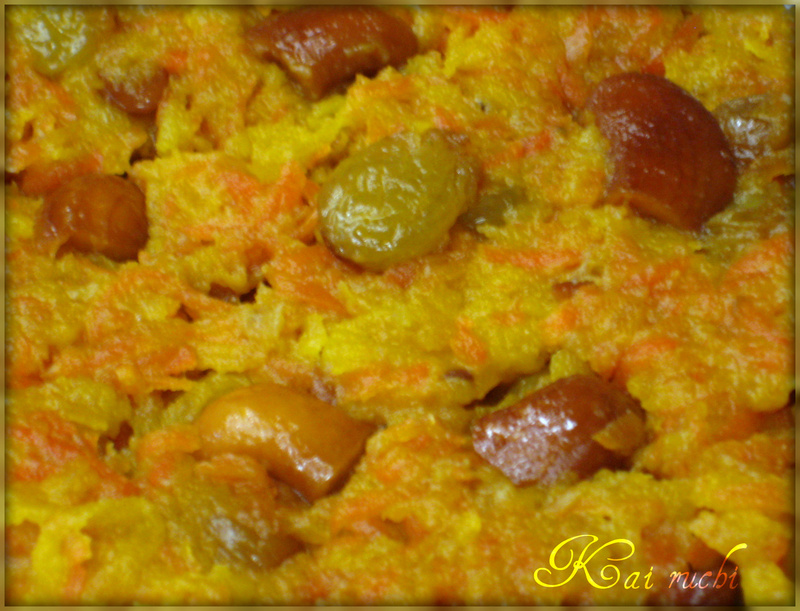 apple,banana,carrot…wow…healthy n delicious combo…halwa sounds so yummy..never tried this combo this way…too good! Lovely halwa with different combo. Love ur banana walnut bread too. Yummy abc halwa like this name, looks so inviting.